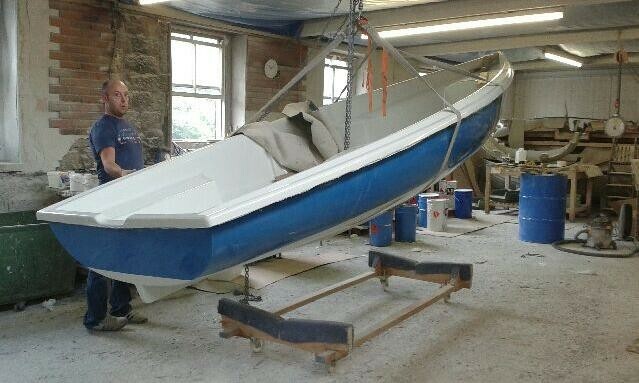 Glyn Rawson of Peak Dinghy has produced the latest Trio hull. Proudly presented after the AGM at Exe SC members were thrilled to examine the unfinished hull, the first to be built for several years. Our first new Trio came out of the mould this week and we plan to bring it down to the Nationals on the Friday for everyone to have a look. We just need to fit it out and given all the other work we have on it’s going to be tight, but we will give it our best shot. 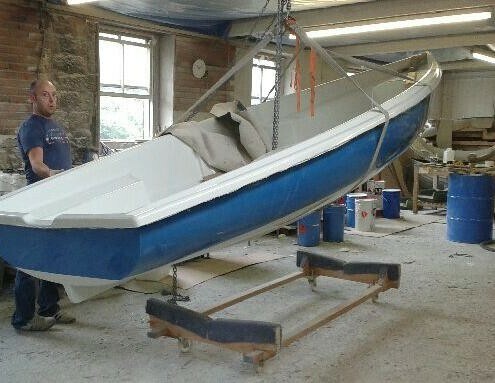 Here’s a photo of the boat just after she was lifted out of the mould. We are also taking over responsibility for all Trio spares and have already been busy supplying Sails, spare parts and Trolleys and Trailers. It would have been good to attend the whole of the Nationals, but unfortunately we booked a holiday in St.Ives before we took over the Trio. However, we are setting off a day early to enable us to come along to the Nationals on Friday and stay on in the evening for the AGM. We are keen to meet everyone and hear your thoughts on the Trio and what we can do to take it from strength to strength. It was good to come along to the AGM held at the Nationals the other Friday. The early finish to racing on the day and the subsequent early start to the AGM caught me out a little, but at least I was able to sit in towards the end and meet everyone. It’s clear that the members are a very active and passionate group and that’s great to see. After the meeting we all went out to see our first boat. It was just the hull at this stage, but at least that gave everyone an opportunity to see the quality of the build. Everyone appeared to be impressed, including Andy Simmons. I hope that Andy feels t hat he has passed his Trio into a safe pair of hands. After the AGM I had a chance to have a chat to people and I received several offers of help from those keen to help the promotion of the Trio. As there were a lot of new faces, I am afraid that I did not keep a proper note of who offered what. All the ideas were very interesting and I would be grateful if people could get in touch with me so that we can move things forward. I left the boat at Exe Sailing Club whilst we had a family holiday in St. Ives, calling back at the Club a week later to collect it. Thank you to Exe Sailing Club for looking after the boat for a week. Word that the Trio is being built again is spreading and we are getting enquiries from as far away as the highlands of Scotland, a centre there had borrowed a Trio and they were very impressed. Another enquiry was made after a chap had tried out a Trio at Whitefriars Sailing Club over the weekend and liked it a lot. He has just sold a Drascombe Lugger and was looking for something a little more manageable and thinks the Trio fits the bill. We have been contacted by a couple of people who feel that the PY number is not correct. 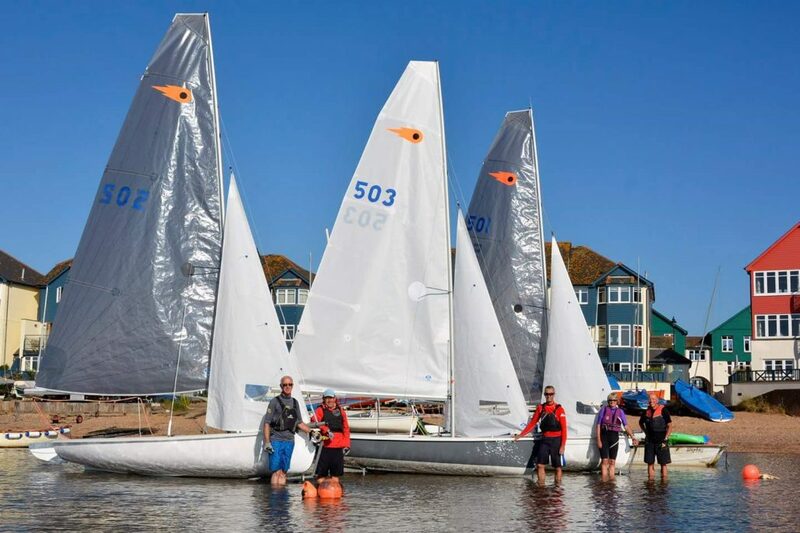 I have had a look at the relevant section of the RYA website and that sets out how Clubs can submit their racing returns to the RYA to aid the setting of the national numbers. There is also information on how to set a local PY. Here’s a link to the RYA website http://www.rya.org.uk/racing/Pages/portsmouthyardstick.aspx I would welcome the views of the wider membership; do you think the PY is correct or not, should there be a separate PY for boats sailed without a spinnaker? The RYA has set a provisional PY of 1077 for the new Trio. Due to the success of Exe Mark 2 Trios a further reduction to 1056 has been applied. This is still an experimental number which will vary as more race results are uploaded to the RYA. New boat sales are up to sail No. 503 with 504 ordered and being built. 505 has now been ordered. Latest Builds demonstrating a choice of laminate or dacron main sails.